The Chihuahua's history is puzzling and there are many theories surrounding the origin of the breed. Both folklore and archaeological finds show that the breed originated in Mexico. The most common and most likely theory is that Chihuahuas are descended from the Techichi, a companion dog favored by the Toltec civilization in Mexico. No records of the Techichi are available prior to the 9th century, although dog pots from Colima, Mexico, buried as part of the western Mexico shaft tomb tradition which date back to 300 BC are thought to depict Techichis. It is probable that earlier ancestors were present prior to the Mayans as dogs approximating the Chihuahua are found in materials from the Great Pyramid of Cholula, predating 1530 and in the ruins of Chichen Itza on the Yucatán Peninsula. In fact, wheeled dog toys representing both the "deer head" and "apple head" varieties of Chihuahua have been unearthed across Mesoamerica from Mexico to El Salvador. The earliest of these were found at Tres Zapotes in Veracruz, Mexico, which date to 100 AD,indirect evidence that the breed was in Mexico over 1400 years before the first Europeans arrived. Dog effigy pots dating to around 1325 AD discovered in Georgia and Tennessee also appear to represent the Chihuahua. In 1850, a pot featuring the "deer head" variety of Chihuahua was unearthed in old ruins at Casas Grandes in the Mexican state of Chihuahua, which dates from 1100–1300 AD showing the long history of the breed at this site,although most artifacts relating to its existence are found around Mexico City. It has been argued that these pots arrived with survivors from the Casas Grandes site in Chihuahua, Mexico, after it was attacked and destroyed around 1340 AD. There are two varieties of Chihuahua – the Smooth Coat (short haired) and the Long Coat. Both the Smooth and the Long Coats have their special attractions, are equally easy to keep clean and well groomed. The UK Kennel Club considers smooth and long coated Chihuahuas two distinct breeds, matings between the two are not eligible for KC registration. How a Chihuahua turns out depends mightily on the genetic temperament of his parents and grandparents. Chihuahuas can be easily provoked to attack, and are therefore generally unsuitable for homes with small children. The breed tends to be fiercely loyal to one particular person and in some cases may become over protective of the person, especially around other people or animals. They do not always get along with other breeds, and tend to have a "clannish" nature, often preferring the companionship of other Chihuahuas or Chihuahua mixes over other dogs. These traits generally make them unsuitable for households with children who are not patient and calm. If properly managed by older children, 13 and up, they can adapt to this kind of living with a dedicated owner. The temperament of its owner can make a difference in the temperament of the pup. Apple-headed chihuahuas can have moleras, or a soft spot in their skulls, and they are the only breed of dog to be born with an incomplete skull. This is not a defect; it is a normal adaptation facilitating the passage through the birth canal and growth and development of the domed type of forehead. 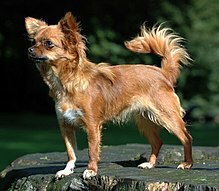 The molera is predominant in the apple heads and is present in nearly all Chihuahua puppies. The molera fills in with age, but great care needs to be taken during the first six months until the skull is fully formed. Some moleras do not close completely and require extra care to prevent injury. Chihuahuas may tremble or shiver when stressed, excited or cold. Chihuahuas, especially the short-coat variety, are less tolerant of cold than larger breeds, and require a sweater and/or boots in cold weather. They will seek warmth in sunshine, under blankets, or on furniture, or human laps. The average lifespan for a Chihuahua is between 12 and 20 years. Chihuahuas and chihuahua/Chinese Cresteds mixes have rated highly in the World's Ugliest Dog Contest, including a purebred chihuahua named Princess Abby (winner of the 2010 contest) and a crossbreed named Yoda (the 2011 winner).